FD3S 99 Spec LED Tail lights. 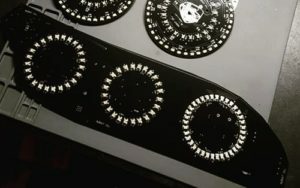 Custom led boards. Due to new production methods, I’ve been able to reduce the price! 99 Spec FD LED Conversion! 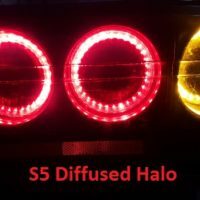 Turn signals: Outer Ring in Amber/Yellow LEDs. 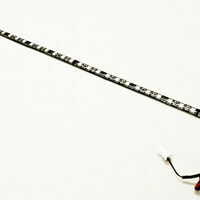 A load resistor is supplied for those with stock wiring to prevent “hyper-flashing”. Heat is not as big of an issue, but I will not install them for you. This design is not to exact sizes as the OEM 99 Spec tails, so I cannot confirm that the 99 Spec tail covers will correctly display the leds. The FD led boards have been designed with animations in mind. You can easily add on a sequential turn spinning animation to the Turn ring. You can take it a step further and add in a Ghozt Module Animation controller or ZLEDS Bluetooth Phone controller. The leds have interrupt solder jumpers and pads so you can inject the animation control to series of leds for any portion of the tail light. 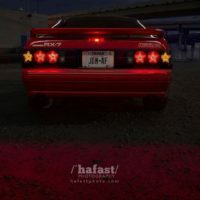 There are over 20 connections per tail light for animation control! ANIMATED VERSION IS AZRX7 INSTALL ONLY. No DIY option. Animated mode is run by Zleds Bluetooth controller. It allows customization of the startup running light sequences, Brake pattern animation, Turn signal animation, and SHOW MODE! The tails will function as a normal led conversion until you power the show mode wire. You can then use you Android or Iphone to connect to the tails and adjust settings and pick which show mode animation you like. For street safety, the standard car functions(brakes,turn,running) will shut down show mode if they are activated. That way you won’t accidentally leave show mode on while driving down the road. 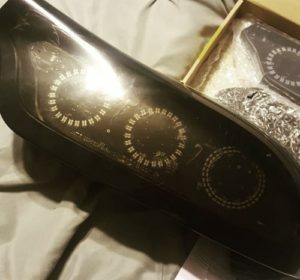 The Standard kit cost is a DIY price shipped. We can install the kit for you for at no additional labor cost. We charge a $50 shipping fee to send the tail lights back in this case. Local installation is an option as well. These are not certified by NHTSA and are for off road/Track/Show use only. Professional grade circuit boards and components designed to withstand the harsh automotive environment. The circuit boards are made to be an almost plug and play system. Removing the lens is all that is needed to install these. The wiring uses stock bulb sockets so there is no cutting of the harness. The LED’s will be in a dangerous electrical system which can easily kill unprotected lights. All LED’s have voltage regulated circuits with diode reverse voltage protection. 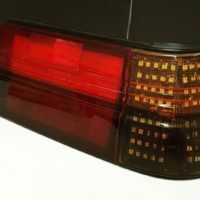 Brake light brightness is a vital requirement so they use high quality automotive grade LED’s. They can easily be seen during the day even in the bright Arizona sun.